After single-handedly destroying a German Mark V Panther tank that had pinned down his unit, First Lieutenant James ‘Maggie’ Megellas leads his platoon from the 3rd Battalion, 504th Parachute Infantry Regiment, 82nd Airborne towards the Belgian town of Herresbach, 28 January 1945, as the Battle of the Bulge draws to its conclusion. Minutes before, despite being vastly outnumbered in heavy snow and freezing conditions, the platoon had overwhelmed and completely defeated a large force of German infantry in a ferocious frontal assault, without losing a single man. Simon Smith’s dramatic new image picks up the story as, with the Panther rendered harmless, Megellas readies his men for their final advance into Herresbach. The Publishers are extremely honored that ‘Maggie’ Megellas – who gave his own unconditional approval to Simon’s stunning rendition – has personally signed every print in this new edition as a living reminder of one of the most inspirational stories of World War II. Officially recognised as ‘the most-decorated officer in the history of the US 82nd Airborne Division’, James ‘Maggie’ Megellas commanded a platoon in ‘H’ Company, 3rd Battalion, 504th Parachute Infantry Regiment, 82nd Airborne Division. Serving with ‘H’ Company for the duration of his war he first saw combat fighting in the mountains surrounding the city of Naples in southern Italy in 1943, where he was wounded and hospitalized. In January 1944 he took part in the amphibious assault at Anzio with the rest of the 504th where he was once again wounded during the savage fighting. The 504th PIR then re-grouped in England and in September 1944 Megellas jumped into Holland near Nijmegan on Operation Market Garden. Taking part in the crossing of the Waal River in flimsy assault boats under heavy fire, Megellas single-handedly attacked and destroyed a powerful German machine-gun and Observation post, an action for which he was awarded the Distinguished Service Cross – America’s second-highest decoration. 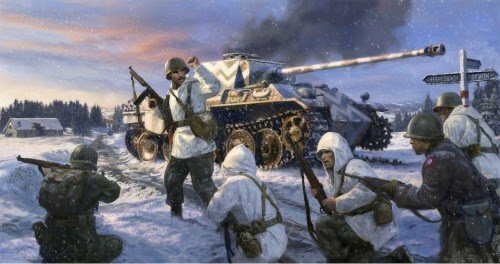 From December 1944 his unit was heavily involved in the bitter fighting during the Battle of the Bulge and while advancing through the Belgian forests just outside the village of Herresbach on 28 January 1945, they surprised a large force of German infantry. During a ferocious frontal attack Megellas and his men, though hugely outnumbered, overwhelmed the enemy within minutes, killing more than 100 and taking a large number of prisoners - without the loss of a single American. As they prepared to assault the town his unit became pinned down by a German Panther tank and in one of the most gallant acts of the war, Megellas single-handedly charged the tank, disabling it and killing the crew with two grenades, eliminating the threat to his men. For this he was nominated for the Congressional Medal of Honor, however he was instead awarded the Silver Star. Later, as the 82nd Airborne advanced into Germany, Magellas was promoted to command ‘H’ Company with whom he had served with such distinction. After the war James Megellas served with USAID for 32 years, including two years spent in South Vietnam. A bill is currently being considered by the House of Representatives to award Lt Col Megellas the Medal of Honor for his actions on 28 January 1945. Simon Smith's subtle use of pencil and his attention to fine detail lend themselves perfectly to create the remarques in this edition. Limited to just 25 worldwide, each copy of the Remarque Edition will have one of Simon's classic original pencil remarques delicately hand drawn in the lower margin of the print, creating a unique piece and this already historic edition. If you have something specific that you would like as your personal drawing - a portrait of 'Maggie' himself for example - please just ask at the time of ordering and Simon will do his best to accommodate your request.